Your Windows Vista has elegant personalized themes and beautiful background wallpaper, and you have tweaked and twisted various Vista parameters and used various tips and tricks for system to perform faster and better, despite on low end computer. But alas, you open up control panel to view system information and Windows Experience Index, and it’s an embarrassing low base score and subscore. This tool will change all this Windows Vista system rating to ensure that you have a perfect Windows Vista system. 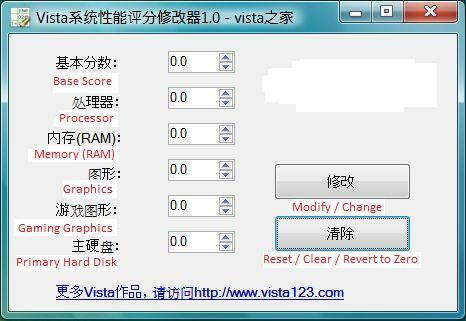 Developer at Vista123.com, a Chinese Vista enthusiast forum have developed a small utility that able to change Windows Experience Index rating score number, include both base score and subscores for all hardware component, to a higher value, in fact, any value you desired up to a maximum of 9.9, so that, well, may be to show off to friends or simply to fulfill your ego of owning a superior computer system. Rating score point when viewing basic information on computer system properties. A perfect computer system to run Windows Vista. How wish the dream comes true. But note that changing these score values does not affect the performance of the system, nor does it change the capability or power of computer’s hardware and software configuration. So if your computer is slow, it’s still running slowly, except for what’s displayed on Experience Index scores. In fact, what the program does is simply changing a few Assessment named with .WinSAT extension XML files in \Windows\Performance\WinSAT\DataStore\ folder. Download System Point Vista Performance Rating Index Changer v1.0 from the forum. The program, SystemPoint.exe, is in Chinese language. But in fact it’s straight forward and easy to use with just few options and settings. Figure below will illustrate with English what each fields mean, and guide on how to use the SystemPoint tool. From screen capture of SystemPoint system performance (Experience Index) scores changer, how to use the program is pretty obvious. Simply change the number of value for Base Score and each hardware components – Processor, Memory (RAM), Graphics, Gaming Graphics, and Primary Hard Disk, then press on the top button (Change / Modify) to proceed. A dialog will pop up to inform you then score changed is done, then you can view your ‘upgraded’ scores. Refresh or reopen the Performance Information and Tools window if needed. 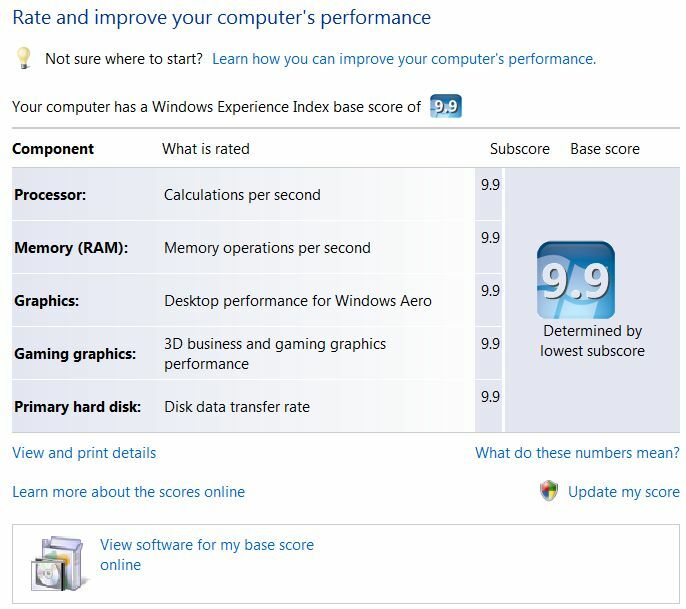 The second bottom button will reset, revert or change back the Windows Performance Index score rating values for all hardware components and base score. After pressing this command, confirm the rating deletion action by pressing Yes button on pop up dialog. The program will delete the XML files, and all rating scores now is unrated. To get a valid Windows Experience Index rating score for your system, you will need to rerun the Windows System Assessment Tool by clicking on “Rate this computer” in Performance Information and Tools under System in Control Panel.